As the United States continues to feel the ripple effects of its family separation policy, caretakers are tasked with the difficult job of helping young people make sense of what’s happening—a tall order when we often struggle to understand ourselves. Adults may feel an initial impulse to shield children from today’s news, but we know that this is not a solution, and may instead contribute to more confusion and fear. In this blog post, our Literacy Specialist, Katie Potter, discusses how educators can use texts, like Step Up to the Plate, Maria Singh, to keep lessons fresh and engaging. Out with the old, in with the new? How about—supplement and complement the old with the new? When I read our middle grade novel, Step up to the Plate, Maria Singh, I was immediately reminded of In the Year of the Boar and Jackie Robinson that I read with my fifth-grade literature circle in NYC (and in middle school almost 20 years ago!) and the challenges teachers face to make required core texts fresh and relevant to students, especially when a text (no matter how many awards) may “feel” old to students. For many people, the United States is the beacon of hope, a place to live the “American Dream.” From the first Irish immigrants who arrived in the early 19th century to the current refugees trying to escape their war-torn countries, the United States was and continues to be shaped by the different cultures and groups that come to live a better life. With the recent political rhetoric and the increase in anti-immigrant sentiment, it’s now more important than ever to not see an “us versus them” situation, but rather to celebrate the differences that actually make America great. In this book list, we’ve rounded up seven of our titles that are about the immigrant experience, and encourage readers to be accepting of all people from different backgrounds. 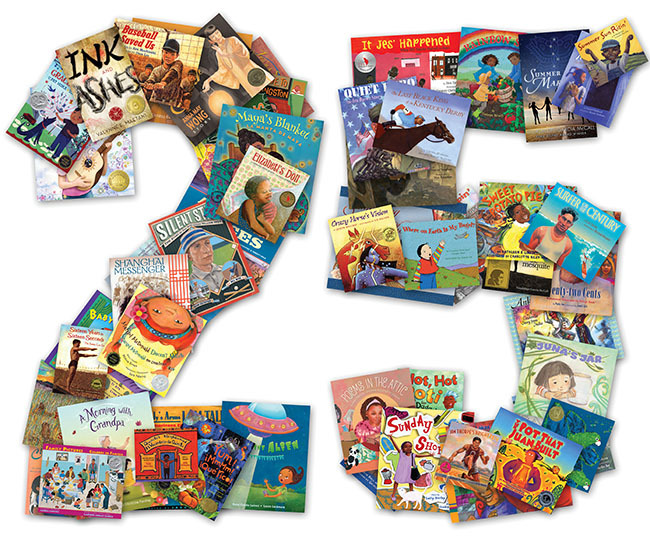 LEE & LOW BOOKS celebrates its 25th anniversary this year and to recognize how far the company has come, we are featuring one title a week to see how it is being used across the country in classrooms and libraries today. Today, we are celebrating First Day in Grapes, an inspirational story for children of all backgrounds. Chico’s story of personal triumph and bravery in the face of bullying is a testament to the inner strength in us all.